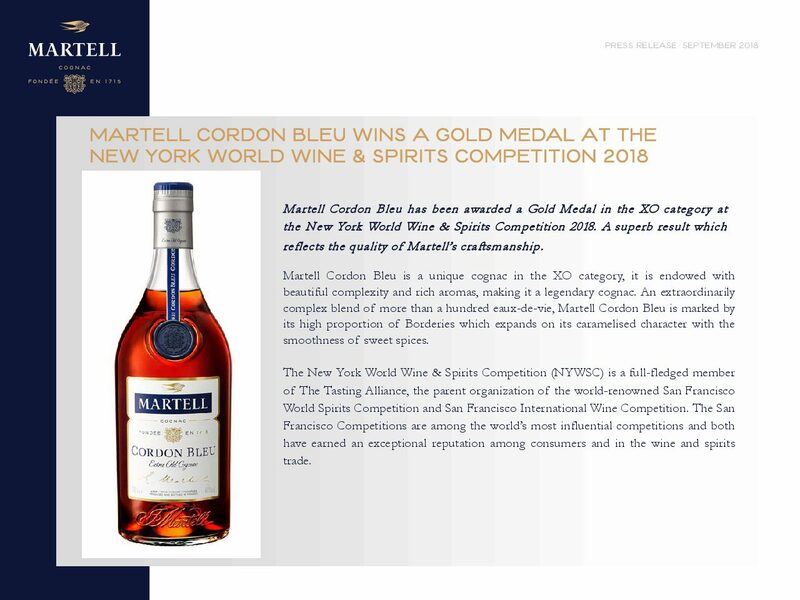 Martell Cordon Bleu has been awarded a Gold Medal in the XO category at the New York World Wine & Spirits Competition 2018. A superb result which reflects the quality of Martell’s craftsmanship. Martell Cordon Bleu is a unique cognac in the XO category, it is endowed with beautiful complexity and rich aromas, making it a legendary cognac. An extraordinarily complex blend of more than a hundred eaux-de-vie, Martell Cordon Bleu is marked by its high proportion of Borderies which expands on its caramelised character with the smoothness of sweet spices. The New York World Wine & Spirits Competition (NYWSC) is a full-fledged member of The Tasting Alliance, the parent organization of the world-renowned San Francisco World Spirits Competition and San Francisco International Wine Competition. The San Francisco Competitions are among the world’s most influential competitions and both have earned an exceptional reputation among consumers and in the wine and spirits trade. Martell, the oldest of the great cognac houses, was founded by Jean Martell in 1715 at the height of French art de vivre, when gastronomy, taste and craftsmanship were celebrated and enjoyed with style. These became the three pillars of the House of Martell and remain intrinsic to the Martell vision today. For three centuries, Martell has produced, exported and marketed cognacs which are recognized worldwide for their outstanding quality and finesse, obtained through double distillation of exclusively clear wines and aging in fine-grained oak casks.